By using the deep penetrating heat from basalt stones during massage therapy, the body is able to bring about a healing response by balancing itself on all the levels of being –emotional, mental, physical and spiritual. 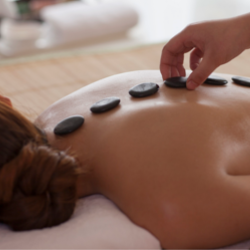 The stones used in hot stones massage therapy are formed from volcanic lava, enabling them to retain their heat. Various shapes and sizes of stones are used to create an effect on the different parts of the body and thus, in a flowing and continuous movement, bring about the feeling of wellbeing and harmony. You can start with this course immediately on enrollment and all your course material and student pack will be send to you within 7 –10 days after enrollment is received.